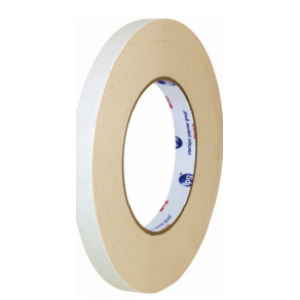 Double-sided tape is a pressure sensitive tape that is coated with adhesive on both sides. It is designed to stick two surfaces together, often in a way which is not visible in the end product, due to it being in between the objects rather than overlaying them. This allows for neater looking projects and better craftsmanship. 145651 1/4" 36 yds Beige 10.4 Mil 144 4.6 lbs. 151554 1/2" 36 yds Beige 10.4 Mil 72 21 lbs. 60835 3/4" 36 yds Beige 12 Mil 48 48 lbs. 98872 2" 27 yds White 7.9 Mil 24 18 lbs. 159589 2" 36 yds Beige 12 Mil 24 24 lbs.